To continue with a few facts from observing the war in Gaza, one subject to note: the outside international countries, citizens, unions, and other organizations are appalling, and ghastly, according to how they loose the prime context within the subject. There are a few subjects the media, and the third parities avoid mentioning. First, the media does not advert to the rally of hate and honor that Hamas held before they started to shoot rockets. The media fails to recognize that Israel waited and asked Hamas to stop shooting rockets. If Hamas were so concerned about the death toll, why would they start and continue to shoot rockets into Israel in the first place? Despite the bombardment that Gaza is experiencing—Hamas continues to shoot rockets into Israel. I am astounded at the reaction of the world as a third party—outside looking in, and how the media portrays Israel as the aggressor. The only reason Israel looks like the aggressor is that of the death toll. Israel will not agree to a cease-fire because they know that this dilemma will explode into their face again with Hamas. It looks like a ground invasion may happen to end the politics of Hamas. From traveling Egypt to Turkey and studying the ideology, behavior, and the ultra sensitivity of Islam—the clarity is apparent—the entire Islamic world is despicable over the little piece of land they lost in 1948. Interesting enough, Egypt is holding their ground by keeping the border at Rafah closed. Egypt did say they would receive wounded, but Hamas said “No” to the offer, commenting, “Not allowing civilians to leave with the wounded is unacceptable”. The exasperation of Gaza is understandable because of the blockade and the freezing of welfare funds from the West. Although, Hamas refuses to surrender their hate, and more extreme rocket ammunition could enter Gaza if there were not a blockade. Striving to look at both sides of the picture and researching the history from November 29 1947 to the Declaration of the Independent State, I wrote this information that was based from incorrect information derived on a public opinion on the side of Israel. The truth of happened was difficult to attain because most young people are clueless. Talking to older people of both sides, Jewish and Palestinian, and hearing the same story of context, the next paragraph displaying the Palestinians as the aggressor is incorrect. The Arabs countries did attack in May of 1948, although up to that time is the subject I am referring. Please read this article for the truth of what took place after the partition of Palestine. Indeed, both parties involved have made mistakes formerly, although in 1948, the Arabs attacked Israel, the result—the Arabs lost more land that was partitioned in the original accordance. Before the Jews entered Palestine the British lied saying the land was empty. 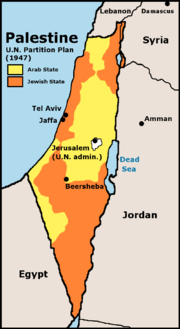 Consequently, the refugee problem resulted because the Israeli Jews entered through the door or war and not peaceful beginning in November 1947. The Palestinian people were lied too, the Israelis said they could come back to their land after the war. Israel never allowed people to come back, instead they occupied the land. 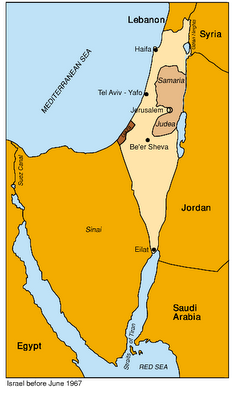 The UN partition map, the Arabs lost more land because of losing in the war of 1948. The map before the war of 1967. It’s remarkable of the survival of a nation that is surrounded by neighbors that express their hate. An old saying—from the heart the mouth speaks, it’s true, listen and ascertain. From the last year, I have listened to people’s despicable and loathsome comments toward what is different from them. The most common words of hate are linked to a person’s patriotic nationality; smaller groups, such as the people of Siwa, and the Nubians in Egypt, and the different groups of Bedouin express a stronger sense of identity that is linked with the sense of survival because of being a minority. The majorities of Arabs speak with hate toward Israel and have discrepancies with the West. The Christians are one group who voice their hate toward the Muslims. From all the Muslims that I met, very few next to none have voiced their hate for the Christians; they do view that the Christian and Muslim God are the same God. The Israeli’s voice their frustration coupled with hate toward the problems with the Arabs; in addition, they voice their confused displeasure and question why the whole world hates Israel. I have explained that there is good and bad people in each cultural, and many Jewish people formerly have publicly demonstrated qualities of the darkness that has caused the attachment of stigma. The behavior of a country determines upon an acceptance of others, the behavior and intention of Israel is wicked. The Israeli culture is different from a Jewish person that is from a different country. Even some Westerners that I have met traveling have voiced their discrepancies toward the other culture, most prevalent of Europeans. Love for the country and culture causes hate, disputes, and divisions. The attachments to ones own identity and culture; the position of identity submerged within duality; humans deluded under extreme rules of principle based on ideology of cult mentality—as long as those qualities exist—hate will always be rooted in the human heart. Observing the extremism of some Americans is mind-boggling. I will be heading north to stay with the sister of the family for a week or longer. Hezbollah is threatening violence and having rallies in Lebanon, although it seems like just a threat. Good thing everyone has bomb shelters, just in case. Next post: Gaza Continued—Heading to Nahariya. Previous post: The Gaza Dilemma.